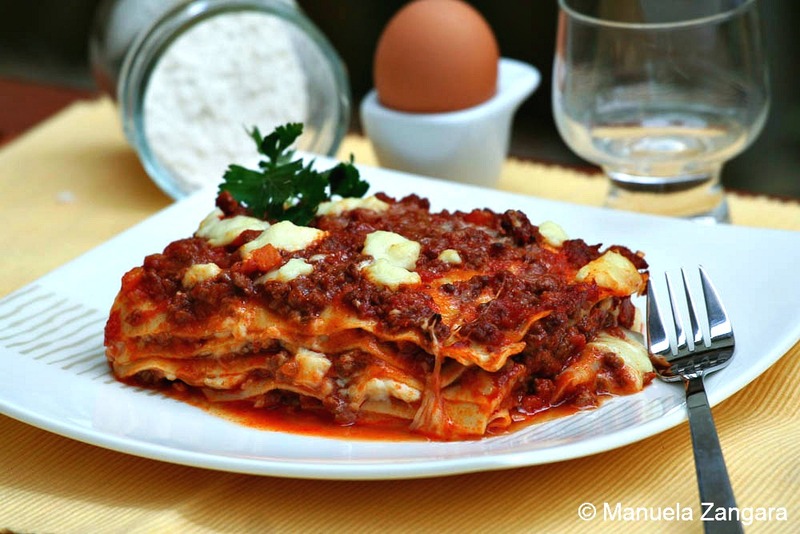 Today I want to share with you the recipe for one of the most iconic Italian dishes ever: lasagne. It is a dish for special occasions or Sunday lunches spent with family and friends… so it is more time consuming than a mid-week dish. But I can guarantee you that you will not mind the little bit of extra work involved after you taste the first bite. This is one of the first dishes I learnt how to make. My parents and I would work on it all together. My mum would make the meat sauce and the béchamel sauce, my dad would make the pasta sheets and I would assemble the final dish. 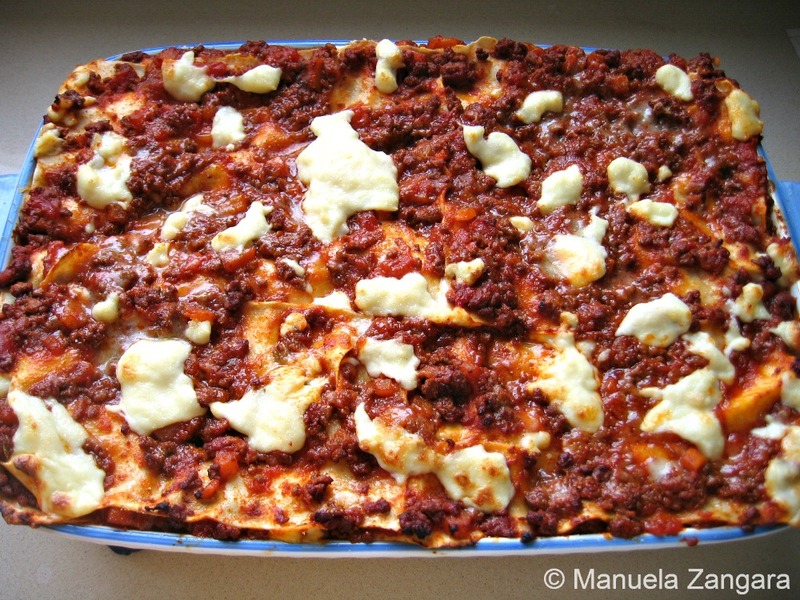 I have a great memory of Saturday afternoons spent preparing lasagne for a special Sunday lunch. 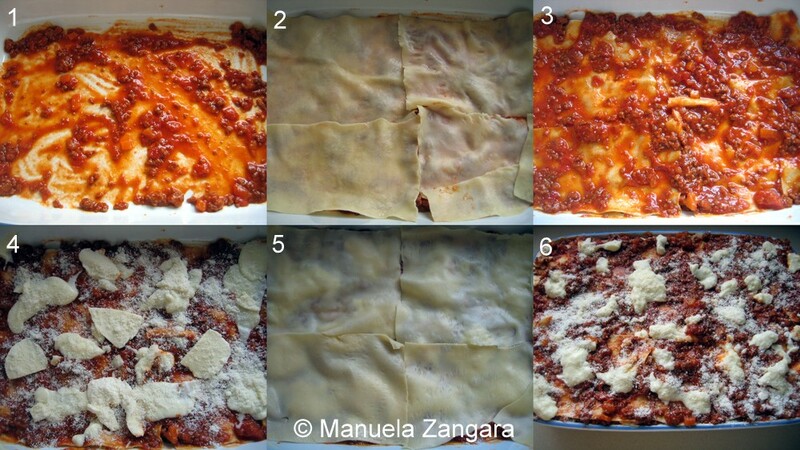 I am going to include this recipe in my Regional Italian dishes series, under Emilia-Romagna, though I must admit that evey family in Italy has its own recipe for lasagne and this is my family’s version (similar but not exactly the same as the version/s of Emilia-Romagna). Another small note before I leave you to the recipe: we do not use chicken for lasagne. I have never eaten lasagne (or other pasta to tell you the truth) made with chicken. 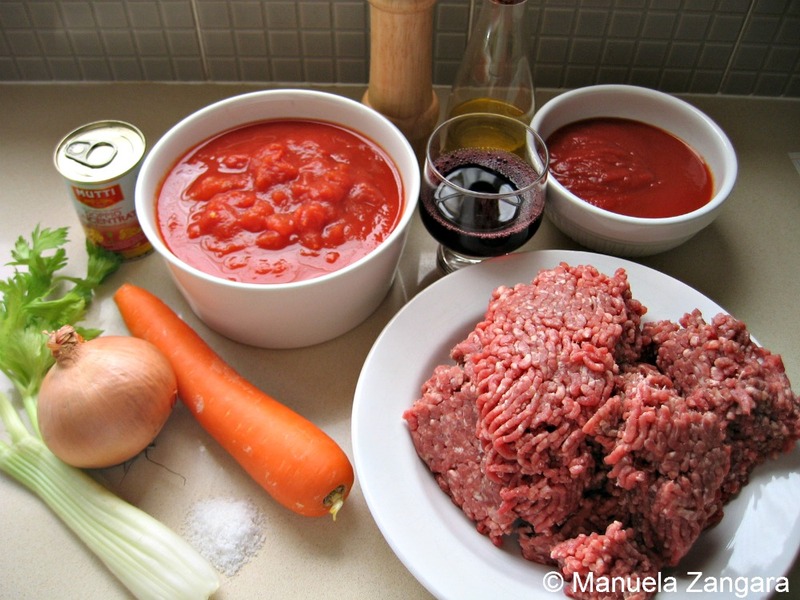 You can however, use pork or veal or a mix of beef, pork and veal mince for the meat sauce. 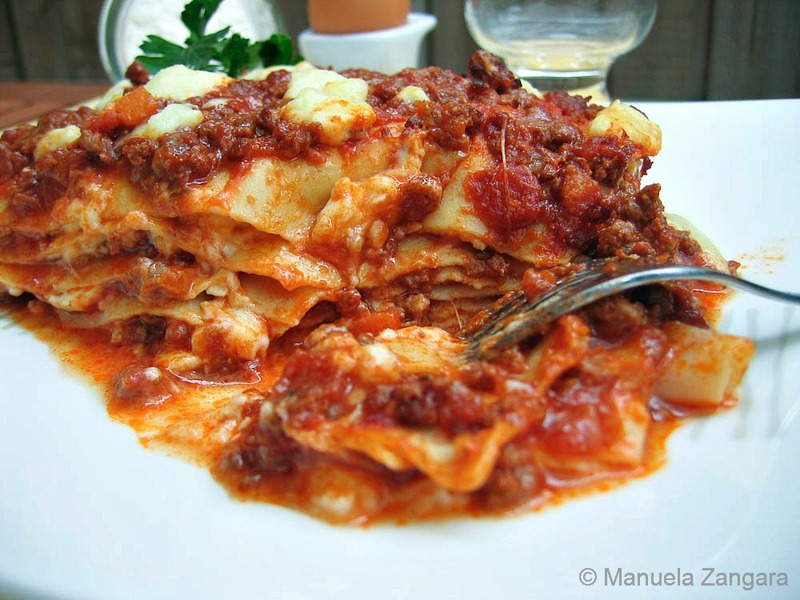 Also, the correct name is lasagne (plural) and not lasagna (singular)… as there is more than 1 sheet of pasta in there! I hope you make this dish, maybe together with your loved ones and that it can be a source of lovely memories for the future, as it is for me. Enjoy! Put the extra virgin olive oil, celery, carrot and onion (1) and sauté for a few minutes, until the vegetables are soft (2). Add the mince (3), stir well and break all lumps with a wooden spoon. When the meat is nicely browned, add the wine (4) and cook off the alcohol by increasing the flame. Then add all the tomatoes (5), herbs, salt and pepper and fill with water till the brim of the pot (6). Lower the flame to medium- low, cover and let the sauce cook for at least 1 hour, or until thick. Keep aside. Put a large pot with salty water on the fire and bring to a boil. Cook the pasta sheets in it for 1 minute. Do this in batches (I use a shallow but large pot and I cook them in 1 layer, so I am sure they do not stick together). Remove them with a slotted spoon and put them on a clean tea towel to cool down. Now you are all set to start assembling your lasagne. 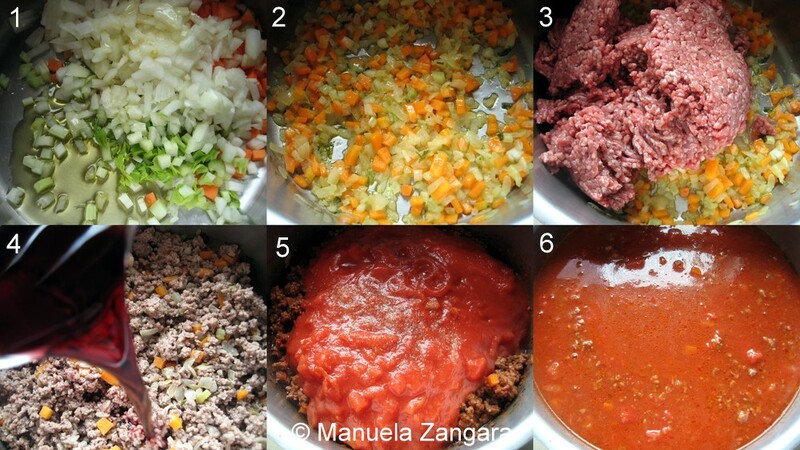 Start with a layer of meat sauce at the bottom of an oven proof dish (1). Add a layer of cooled pasta sheets, making sure not to overlap them (2). 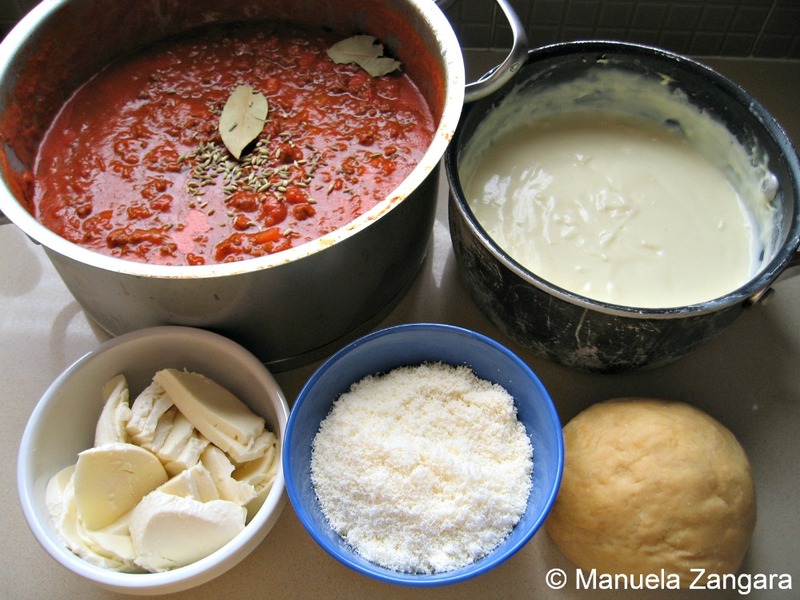 Now cover them with a layer of meat sauce (3), some béchamel sauce, sliced mozzarella and grated Parmigiano Reggiano (4). Do this for 5 to 6 layers (5). On the last layer (the top most layer), do not put mozzarella or it will burn and it will taste bitter (6). Cook the lasagne in a pre heated oven at 180°C – 355°F for 20 minutes, then grill for 5 to 10 minutes until the top gets golden brown. Serve warm. NOTES: you can make the meat sauce the day before you assemble lasagne and you can assemble them the day before you serve them. Store them in the fridge and remember to take them out a few hours before baking them (you have to bring them back to room temperature) to make sure they do not remain cold on the inside even after they are baked. These looks amazing..making me very hungry!!! 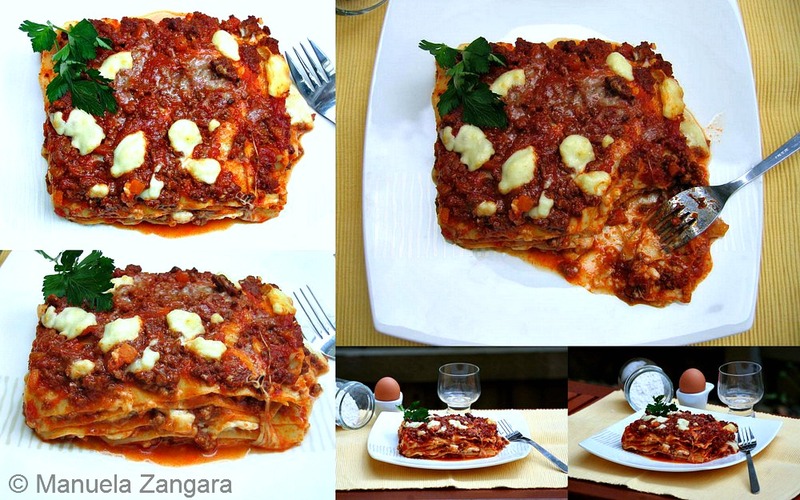 Oh yes, what is more Italian than a lasagne? I love, and doesn’t matter what it has inside, I just like the smell, and the melted cheese. I am bookmarking this recipe, as I have a kilo of mince in the freezer to use up. It looks divine! Wow! This looks fantastic. We also never ate lasagne with chicken. I can’t wait to test out this recipe. Hi Manu! I wonder if this would be good if assembled and frozen before baking?? I’ve done it a zillion times, but only with pre-made (ew) lasagne noodles, not fresh. This time I’d like to do fresh like you. The lasagne would be frozen for about 4 weeks. Think they would hold up ok? Nothing like a nice lasagne to start off winter..i feel a craving coming along YUM! That is one perfect-looking lasagna!